Born in the USSR, 1927. Settled in Israel in 1972. Between 1946-1952 Kogan attanded the Moscows State Conservatory where he studied piano and was a composition student of Aram Khatchturian. He has devoted much time to the research, creation and performance of Jewish music. 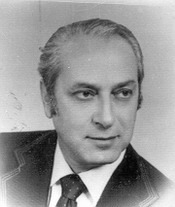 Kogan was awarded the title ‘Honored Artist’ by the goverment of the USSR. Among his compositions are many work for ballet, musicals, opera, film and for television as well as 250 Yiddish songs in Israel, creates many productions for the Yiddish theater and Chassidic, Yiddish songs and music.